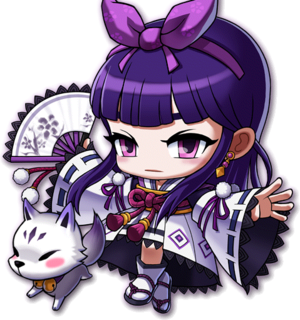 Kanna is part of the Sengoku class type, she uses intelligence as her primary stat (INT) and luck (LUK) as her secondary stat. She uses a Fan as her primary weapon. Although the story represents her as a female, she can be created as both a male or a female in GMS but not in JMS. After years of turmoil, Oda Nobunaga finally seized control of Japan, but his desire for power only grew. He sought immortality, and the temple of Honnou-ji would bring it to him. He prepared an ancient ritual of reincarnation that would see him reborn as The Sixth Sky Demon King, but word of the ritual got out, and the feudal lords stormed Honnou-ji to stop Nobunaga while it was still possible. In the end, a young onmyouji named Kanna disrupted the ritual, and the would-be dark lord’s plans crumbled around him. But victory came at a cost. Just as the ritual was disrupted, a great pillar of light lurched forth from the temple and transported everyone to a strange world. Now, Kanna must conquer this strange place and regain lost strength and allies in order to stop the dark ambitions of Nobunaga's followers. This page was last edited on 28 November 2015, at 19:00. This page has been accessed 49,637 times.